The stethoscope for every medical professional. With the reversible double chest-piece you’ll be prepared for all eventualities in everyday medical practice. The membrane side guarantees optimal auscultation for the entire frequency spectrum and the open bell side is specifically designed for the low frequencies. Our unique ERKA convex membrane has been specially designed for transmitting high and low frequency tones. All ERKA ACOUSTIC, ERKA PULSE and ERKA CHILD stethoscopes have this membrane, guaranteeing you transmission of sound of absolute top class! 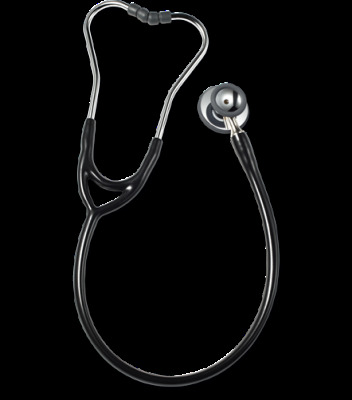 Each ERKA stethoscope is equipped with a perfect ergonomically shaped chest-piece available in different sizes. This enables auscultation even in hard-to reach areas or for different constituted patient. Membrane: The pre-tensioned ERKA. convex membrane provides excellent resonance and sound transmission. Chest-Piece: Highly polished and chromium-plated for a non-porous surface, the brass chest-piece ensures perfect surface hygiene. With the reversible double chest-piece you’ll be prepared for all eventualities in everyday medical practice. The membrane side guarantees optimal auscultation for the entire frequency spectrum and the open bell side as specifically designed for the low frequencies. Binurals: The standard 15° inclined binurals can be individually adapted to the ear canal characteristics of the user. The ergonomically shaped and individually adjustable headset guarantees an optimal fit.